Statuesque and majestic our over 240 cm artificial christmas trees are among our best selling items they look stunning in rooms with high ceilings and are perfect for showcasing large ornaments. The warm candle-like glow of a traditional light in an LED. Light connections are made inside the trunk, so you just plug the tree into the wall. Balsam Hill’s selection of 240 - 365 cm artificial Christmas trees allows you to create a dramatic holiday display wherever you place them. Each is equipped with sturdy branches and fine, deep green needles. Our 240 cm Christmas tree was designed to fit perfectly in two-story living rooms or spaces with high ceilings. If you prefer a more grandiose display, we also offer 365 centimeter Christmas trees that were created with estate-sized homes or public venues in mind. They have been designed to highlight different geographical locations and regions for a variety of natural-looking tree choices. You will find a mix of most realistic, realistic, and traditional branch design throughout our selections. These differ based on the material the trees are constructed with. If you are unsure about the style that you prefer, then you may want to order our branch sample kit. This kit allows you to see and feel each of the textures of the needles that the full size trees are made from. You can also purchase the 240 cm or 366 cm tree prelit or unlit. If you decide to purchase one of the prelit options make sure to take advantage of our signature Easy Plug design. Each section of lights is connected within the trunk with a single wall plug in order to avoid the hassle of manually stringing lights. The prelit trees come with an extra end connector at the top of the tree so if you have a plug in tree topper it will be able to shine brightly. When it comes to storing your tree off season, we provide a free rip-stop nylon storage bag to protect against any damage. 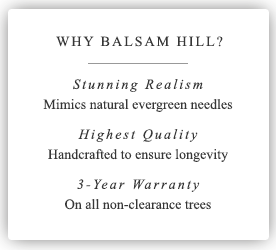 Our Balsam Hill signature trees come with a 3-year warranty so that you can feel confident about your purchase. We know these artificial trees will surely delight your family and friends for many Christmases to come.